You will need: Arduino UNO, MCP23017, 330Ω resistor, push-button switch, patch leads and small breadboard. 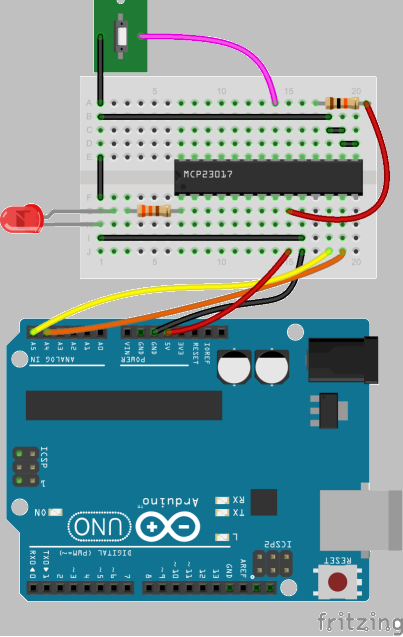 This project demonstrates how the Microchip MCP23017 16-Bit I/O Expander with I2C interface can be used to increase the number of GPIO pins on your Arduino Uno. You can also use it to protect your Arduino's GPIOs from damage - replacing the MCP23017 is much cheaper than replacing the Uno! Link to source code. You will need to use the following commands to compile and run the program. Do this with an ESP8266 or a Raspberry Pi.